Bernard Electrical Company is a family owned business that has been in operation since 2007. With a five team crew,we are dedicated to ensure that we provide world class service and the job is done to your expectations. We pride ourselves in our work and are looking forward to doing business with you. 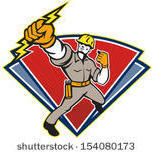 Call us today for all your Electrical needs!